Bleed Eagles Green: Philadelphia Eagles Blog: Rich Kotite - A Super Bowl Champion? Rich Kotite - A Super Bowl Champion? The 1991 season, oh what could have been. The Championship Game collapses of 2001, 2002, and 2003 are our most recent memories of seasons that could have brought the Lombardi Trophy to Philadelphia. And we can't forget the 2004 Super Bowl and Reid's time management skills and McNabb's inability to handle the pressure. 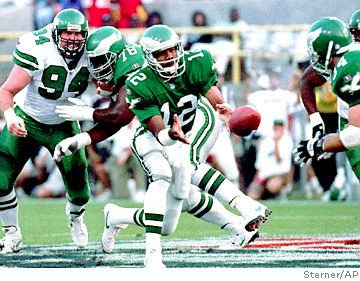 But maybe one of the Eagles' greatest chances to experience Super Bowl Glory was the 1991 season. The hope lasted less than one game. Season opener against the Packers…Randall Cunningham goes back for a pass, is hit by Packers' linebacker Bryce Paup, torn ACL. Cunningham was out for the season. What could have been...the Eagles' defense that year was one of the best in NFL history. The defense finished number 1 against the run, number 1 against the pass, and number 1 in total defense. Instead of the offense matching the greatness of the defense with Cunningham at helm, the fans were left to endure stints of Pat Ryan and Brad Goebel at quarterback. Despite the ineptness of the offense the defense lead the Eagles to a 10-6 record. In the six losses the offense turned the ball over 26 times!